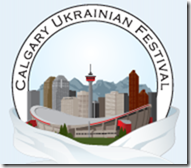 To provide to the citizens of Calgary an informative, educational and entertaining festival that celebrates all aspects of our unique and rich Ukrainian heritage and to raise the profile of Calgary’s Ukrainian Community through a professional and inclusive annual event that showcases Ukrainian arts, cuisine, entertainment and culture while highlighting true Ukrainian hospitality. The annual Ukrainian Heritage Festival offers you three days of warmth, food, fun, and excitement, and we are certain you will agree this is our best festival to date. There is plenty to do and see, so bring the whole family over. Let your children have some magical moments on the rides, or try to win a gift for that certain someone at one of the games. 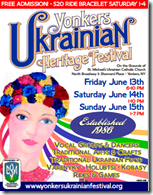 The Ukrainian Club of Kingston this weekend presents Folklore 2013: the Lviv Pavilion with Ukrainian food, performances and exhibitions. The festival will feature church tour, live entertainment by “Cheremosh”, dancing, family activities, vendors, traditional Ukrainian homemade food/beer, raffles and more. “Zolotyj Klen” (Golden Maple) is an exciting celebration of Ukrainian Music, held each summer at the Ukrainian Youth Association camp grounds “Veselka”. The festival is held yearly for Canada Day. It has a wonderful family atmosphere where festival goers can meet many friends. People are free to relax on their own, or participate in the day long program. The concert starts just after lunch and lasts the entire day culminating with a musical act direct from Ukraine! ~ smell the aroma of fresh baked outdoor oven bread… and the taste of this bread is like no other! ~ dance the night away at our evening Zabavas–the best Ukrainian parties always have a Kolomeyka! ~ the beautiful colourful display of folk arts cannot be missed… do you have time to learn how to make a Pysanka? Soyuzivka, also known as Suzi-Q or The Q, is a year-round Ukrainian resort and cultural center located in Kerhonkson, New York in the Shawangunk Ridge area south of the Catskill Mountains of upstate New York, providing workshops, seminars, concerts, dance recitals and art exhibits for those interested in learning about Ukraine and its rich culture. Their annual Ukrainian Cultural Festival is happening this weekend at the resort and will feature bands Hrim, Zrada and Haydamaky. Featuring delicious foods, music, basket raffle, dance performance, venders, cool beverages. The North Dakota Ukrainian Festival is an annual festival featuring authentic Ukrainian cuisine, arts, dance, music and history in Western North Dakota. The festival has been going strong for over 25 years and continues to grow and improve with each year. The main events of the festival include performances by the Ukrainian Dancers Stepovi and the students of the Ukrainian Arts and Dance Camp, meals featuring authentic Ukrainian cuisine (pyrohy, holubtsi, beet leaf bread, borscht, etc. ), displays of Ukrainian arts, educational presentations on Ukrainian history and culture, as well as a lively evening Zabava with a live Ukrainian band and formal dinner. In the fresh air and sunshine, enjoy the incredible view and watch the world-class grandstand shows from the only 11,000-seat, hillside amphitheatre in Canada. Authentic, rich, uniquely Ukrainian and ultimately… delicious! Excite your senses with our all-day-available traditional cuisine. As we tell our stories through costume, song and dance, you will literally see and feel the past come alive. For one whole weekend, escape to become immersed in a new adventure. Let us put a fiddle in your hands, show you a few steps and teach you some Ukrainian songs. Then celebrate with us at the nightly Zabavas; parties thrown in honour of our guests… you! The only Vatra held in Canada, lets you put up your tent, park your car, enjoy the many attractions & so much more. Youth – 16 & under – free admission. Three days of fun – b0nfire, watch how the pigs are roasted & then get to eat some too, concert, performers from USA & Canada, great lottery prizes, two dances to live music, wagon rides, delectable foods including the all-time favourite “flaczke”. Back by popular demand “LEMKO’S GOT TALENT” and so much more. A great family event – young or old, you are sure to have loads of fun. A celebration of all things Ukrainian past and present, Ukrainian Day recognizes the rich tapestry of Alberta’s Ukrainian community today. Ukrainian Day starts with a pancake breakfast, followed by divine liturgies, memorial services and recognition of east central Alberta’s centennial pioneer families. An afternoon concert features some of the finest musicians, dancers and performers. 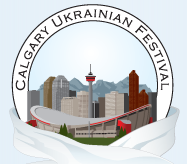 The ‘Taste of Ukraine’ food fair, the Ukrainian Community Showcase & Art Sale help enrich this celebration of Ukrainian culture, heritage in Alberta. This signature event is co-hosted by the Ukrainian Canadian Congress – Alberta Provincial Council. Join us as we honour the 200th birthday of Ukraine’s national bard, Taras Shevchenko. View artwork created by children in Manitoba’s Ukrainian bilingual program and let your family create masterpieces of their own in our craft area. Enjoy some of our culture’s culinary favourites, such as varenyky, holubtsi or kovbassa. The high-energy performers on our main stage are always an audience favourite. Stop into the marketplace to enjoy the live music of many local house bands. Don’t forget to visit the coffee house to enjoy a torte or nalysnyk and the boutique to take home a bit of Ukrainian culture. of international singer and Honoured Artist of Ukraine Marta Shpak as well as local performers the Zoloto Ukrainian Dance Ensemble & Company. After the show feel free to take a spin on the dance floor and children can stop in at our activity zone. 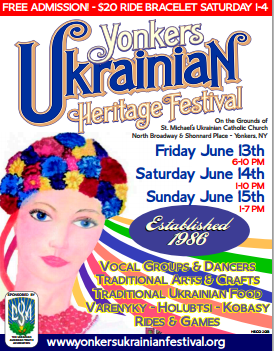 The St. Josaphat’s Ukrainian Festival was established in 1973 as an effort to introduce Ukrainian Arts and Crafts, Ukrainian food, and Ukrainian music and dance to the Rochester community. 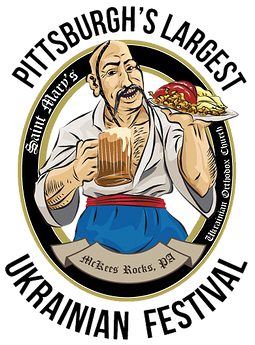 Since its inception the Festival has offered tradition Ukrainian foods such as Varenyky (or pyrohy or pierogies) a potato and cheese dumpling, Holubets (stuffed cabbage rolls), Kovbasa (Ukrainian sausage), Kapusta (Ukrainian style sauerkraut) and Borsch (beet soup) to the public. The Festival also has a number of vendors who display a variety of Ukrainian Arts and Crafts such as ceramics, embroidery, wood carvings, jewelry and Ukrainian Easter eggs. The Ukrainian Stage offers a variety of entertainment including Tradition Ukrainian Folk Dancers and Singers both from Rochester, New York and Canada. 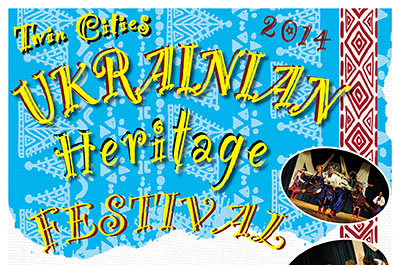 Ukrainian Canadian Congress-Regina Branch proudly announces its annual outdoor cultural festival! The event aims to celebrate Ukrainian-Canadian culture and recognize its people’s contributions to Canadian society at all levels.UCC Regina Branch coordinates the activities for 19 Ukrainian cultural organizations of very dedicated volunteers in our city and this event! Come and Celebrate with us! Bring a lawnchair for your seating comfort! This FREE Festival will honour and celebrate the very best of the Ukrainian culture–food, history, religion, arts and culture—through a fun, hip approach. Not Ukrainian? No problem. We’ll make it happen when you show up at the Passport Office to “assume” your Ukrainian name and identity. Exciting, spectacular, dazzling, breathtaking, exhilarating, spirited, soulful, enchanting, captivating, and intriguing – modest words which describe but by no means capture the essence of Ukrainian folk art, music, and dance. From the rich color and deep symbolism of the delicate “pysanka” (Ukrainian Easter Egg) to the thunderous, climatic, power, rhythm and strength of “HOPAK” – the world’s most exciting ethnic dance, and every brilliant “Kolomiyka” (polka) and soulful folk song in between, we invite you to experience the TWENTIETH ANNUAL UKRAINIAN FOLK FESTIVAL, celebrating the anniversary of our ancestral homeland’s independence. Enjoy a festival stage show, a public dance, Ukrainian foods and baked goods, BBQ pit, kid’s fun area, and Ukrainian hospitality. Catch the musical magic at the Friends’ Ukrainian Music Festival featuring an array of the region’s finest Ukrainian folk musicians. This dynamic event encompasses an abundance of entertainment, exhibits, children’s activities, a village market, and delicious foods. Visit the Historic Village where you can enjoy wagon rides and chat with historic settlers as they go about their daily routines. The Festival was born in 1995 as the result of the twinning of Toronto and Kyiv. It then came under the umbrella of Ukrainian Canadian Congress Toronto Branch as one of its projects. While attendance in the first year was estimated at 3,000, within ten years the Festival has grown to attract audiences of 350,000. The Toronto Ukrainian Festival is a celebration of Toronto’s diversity. It has established itself as one of the premier Ukrainian festivals in North America. The Festival takes pride in showcasing contemporary professional and amateur artists and performers of Ukrainian heritage who celebrate Ukrainian culture through music, dance and visual arts. The festival became a riveting success from its very beginning, with throngs of visitors enjoying unusual foods, arts and crafts, and entertainment on the inviting Cathedral grounds. In a setting of more than six acres and apastoral pond under the shade of the golden domes of the beautiful Cathedral, visitors to the festival are immersed inthe beautiful and authentic Ukrainian mosaic. From the Cathedral to the Cultural Center to the grounds and the permanent outdoor stage featuring Ukrainian entertainment, to the food tents and vendors’ village, to the Kozak beer garden and grill, to unforgettable Ukrainian tortes and sweets, to the Ukrainian deli and an abundance of children’streats and activities, the Washington Ukrainian Festival is so unique that it rightly attracts many thousands of visitorsevery year. The Twin Cities Ukrainian Heritage Festival is held every year to celebrate all things Ukrainian in our community and to demonstrate Ukrainian-American contributions to community life in the Twin Cities area and beyond. We invite all our friends–Ukrainian and non-Ukrainian alike–to join us on this fun, celebratory day! Each year at the festival there are carnival games and other activities for children, Ukrainian food, an outdoor beer garden with Ukrainian beer, and a live concert program both inside and outside of the Ukrainian center. There is also a varenyky (pierogi) eating competition and a competition for Festival Royalty. The Festival Royalty receive pride of place on the Ukrainian community float for the annual Northeast Parade, Aquatennial Parade, and Columbia Heights parade each following year! Also for the first time in 2011 the festival introduced the Ukrainians Got Talent competition. Make sure you come hungry. Delicious homemade Ukrainian food to take home or to enjoy while watching the non-stop performances on stage. Performances featuring Ukrainian dance groups, singers and musicians. Browse the outdoor market showcasing crafts, gifts, art, honey & garlic. Facepainting for the children. Beer garden & BBQ for the adults. Best of all Admission is free. This community fundraiser features great music, singers, and dancers, Ukrainian food and home-made desserts, an international beer garden, games for the kids, vendors and more! Everyone will have fun at the Philadelphia Ukrainian Festival from children to grandparents. There will be Kids Fun Zones, Live Music, Dance Shows, Folk Displays, Auctions/Raffles, and Vendors. Everyone will have a great time at the Philadelphia Ukrainian Festival. It will be held at the Ukrainian Educational and Cultural Center, indoors and outdoors. There will be traditional Ukrainian food such as Pierogies and Kobasa. With its infectious spirit, you can’t help but get swept up into the flurry of activities and excitement that is YARMAROK. Built on the format of Toronto’s world famous Caravan, Nick Nykilchuk, an active member of the Ukrainian community and festival founder wanted to bring that same attention and excitement to Sudbury. With the support of volunteers from its four internal organizations, OYK (the Women’s Auxillary), MYHO (the youth group), the War Verteran’s and YHO, its combined membership first began Yarmarok in 1974. The Ukrainian National Federation was the starting point for many performers who progressed through the Ukrainian School of Language and the Ukrainian School of Dance as they developed their skills in song and dance, growing their passion and building it into a career. Performers like the Black Sea Kozaks dance group, operatic performer of the Austrailian Opera House Oksana Rohatyn, and operatic performer in Toronto and the United States, Joanne Kolomeicz, first showcased their talents at the Ukrainian Festival Yarmarok. Yarmarok has developed, changed and has grown over the years. Now, 39 years later, the Sudbury Yarmarok Festival is a weekend of action packed excitement with performances by the Veselka School of Dance, the Veselka Dance Ensemble, the Sudbury World Youth Exchange, Dnipro Ladies Ensemble, fashion show and featuring “Zabava” for our opening night Gala!